Here at Glacial Art, we love helping people organise stunning events – whether they are corporate events, Christmas parties for companies, birthday parties or weddings. 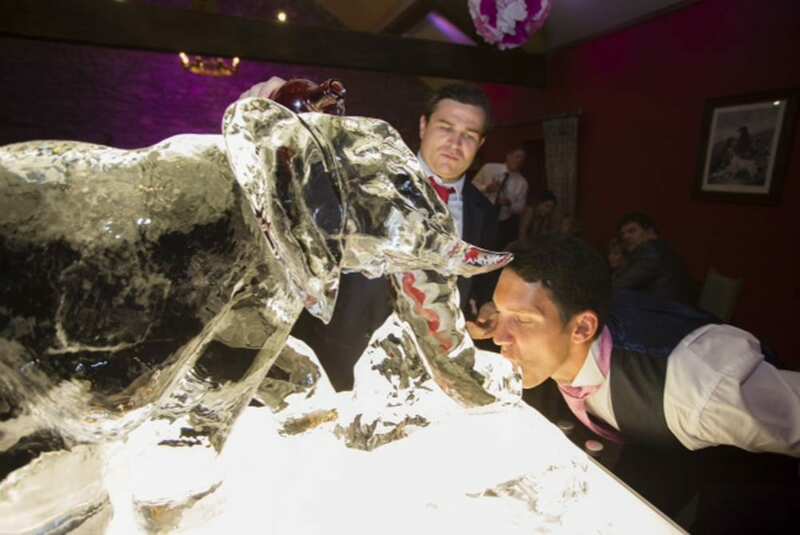 But one of our most sought-after creations has to be the ice luge, a slanted piece of ice that drinks are poured down and into the waiting mouth of the drinker. Vodka is the most common type of alcohol to be used with luges, although it is by no means the only type! If vodka isn’t your thing why not try Absinthe, Tequila or Sambuca? Of course non-alcoholic drinks also work just as well, we just wouldn’t recommend using fizzy drinks like champagne or beer, as on hitting the ice they will fizz up and the drinker will be surprised with a nose full of bubbles! We use two different methods to turn ice sculptures into vodka luges. The first involves us drilling a hole straight through the middle of the ice sculpture – almost any sculpture – so the drink of choice can be poured down through the middle. Alternatively, we can attach a solid, slanted piece of ice to the main sculpture which would carry the alcohol down. Because we have these two different methods of luge formation, virtually any design that we can make into an ice sculpture can be modified into a luge. You can see the hole drilled through the middle of this Mosquito brand logo luge, and the slope attached through the centre of these trees. We work closely with our clients no matter what we’re working on, so luges are no different. 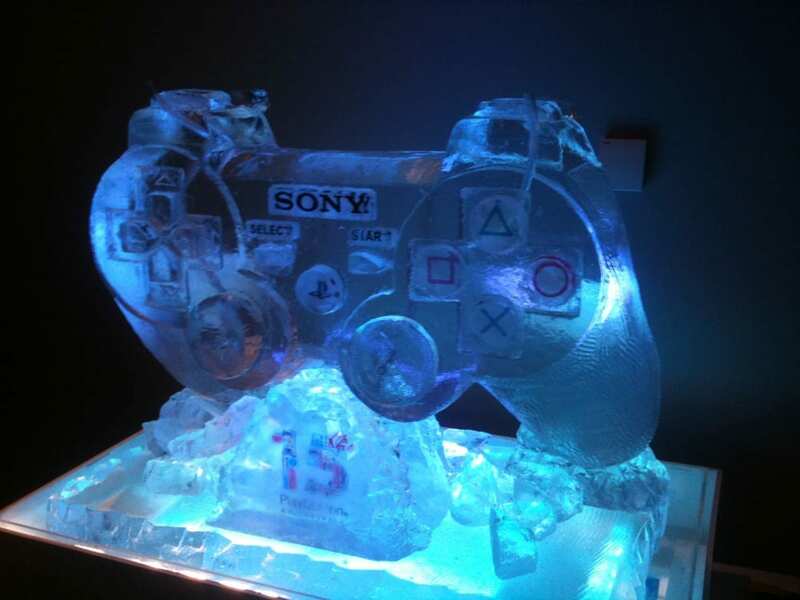 The luge can be attached or incorporated into the design of the sculpture – in 2010 Sony asked us to create a huge PlayStation 3 controller for one of their events which had a double luge incorporated so that the drink came out of the controller pads. 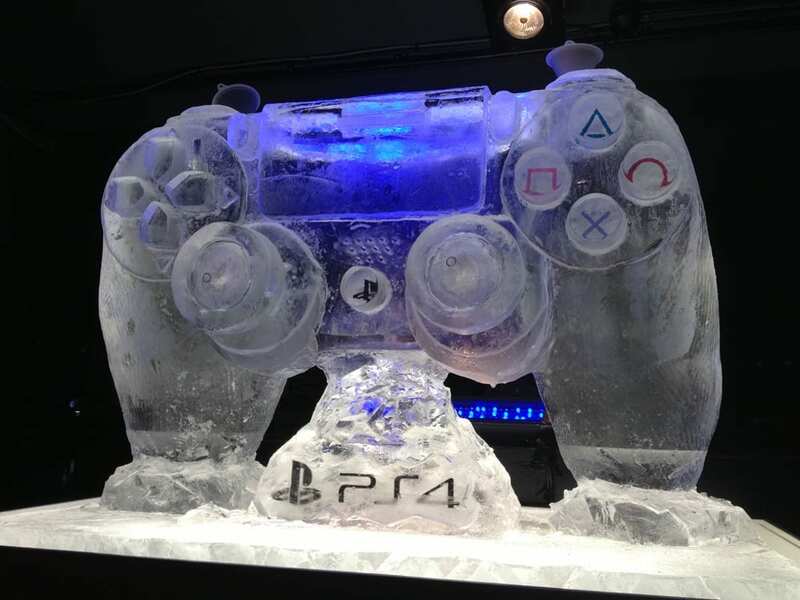 Sony were so pleased that they commissioned a film featuring our ice sculpting skills, and then a further controller luge for the PlayStation 4! Luges can also be fantastic for romantic events. 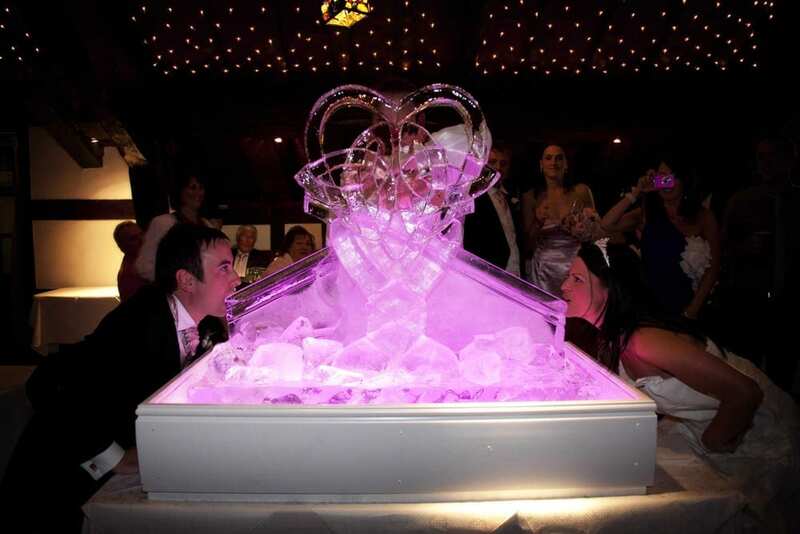 In a modern twist on a wedding cake, one happy couple asked for a cake luge, where they shared a shot together instead of cutting the cake. 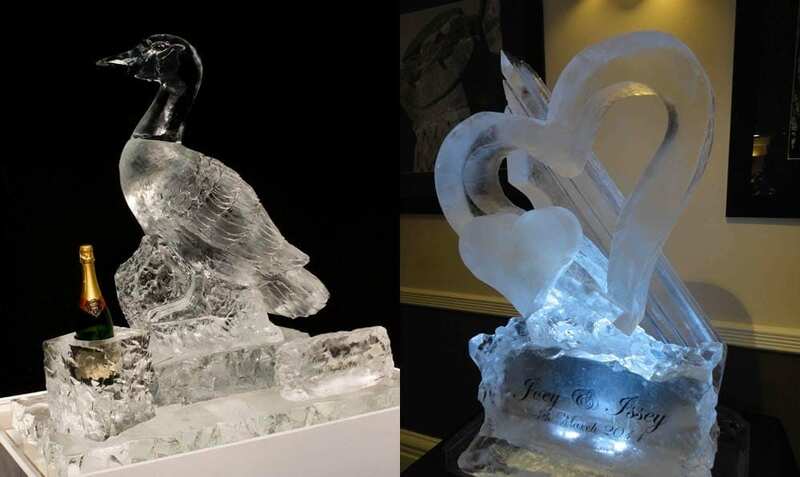 Heart sculptures and luges are also a very popular choice for weddings, but we can go more unusual than that! One couple chose to share their love of Grey Goose Vodka by drinking it from the tail of a huge goose sculpture, after pouring it into the goose’s head! 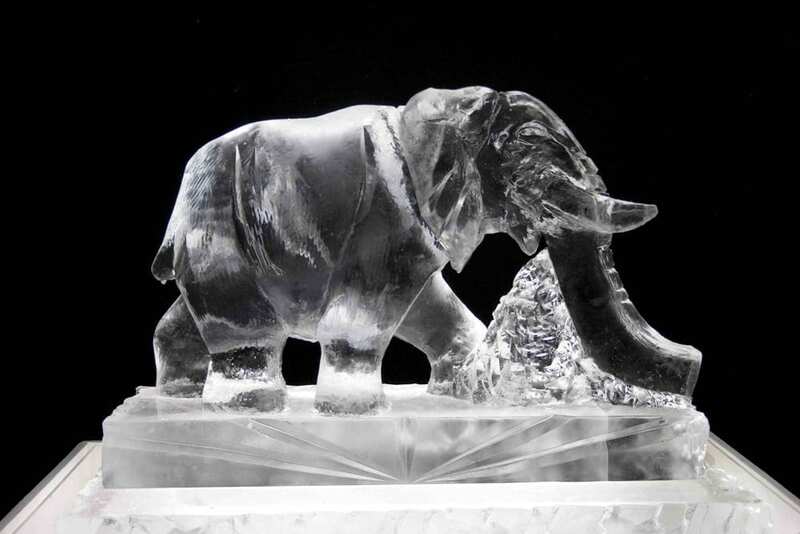 Aside from the goose luge, one of our favourite creations was an elephant, with the luge incorporated into the trunk. That was a very fun way to enjoy a drink! We regularly worked on sculptures and product luges for birthdays and events. 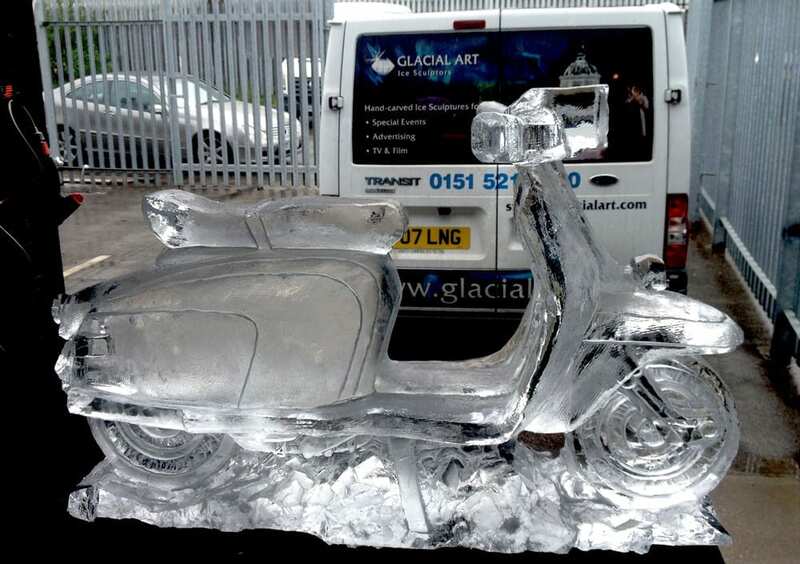 We had our first foray into scooter-sculpting when we were asked to produce a scooter luge for one client’s birthday, this was over 1m in length and 1m high. The client loved the sculpture when we delivered it to her, exceeding her expectations and everyone in her party admired and enjoyed drinking from it! We’ve also made Bat Mobile and F1 car luges. These large product pieces tend to take us a little longer than logo pieces, sometimes more than three days. We love a challenge and it gives us the opportunity to flex our creativity! 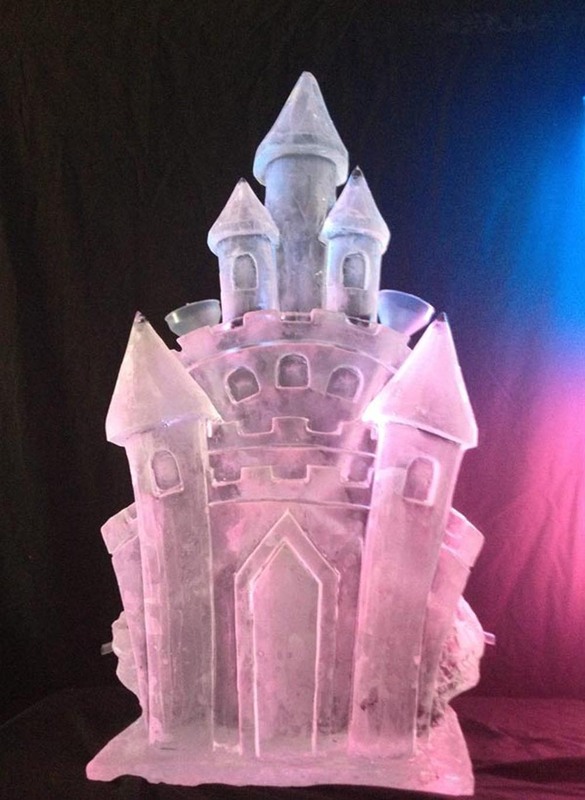 Incorporating two luges into one sculpture is a great way to share the event, and not just for couples – we sculpted a Disney themed castle luge for a pair of twins’ 18th Birthday party so they could have a shot together! Over the winter season and especially Christmas we see a huge rise in the sculptures and luges that we make. 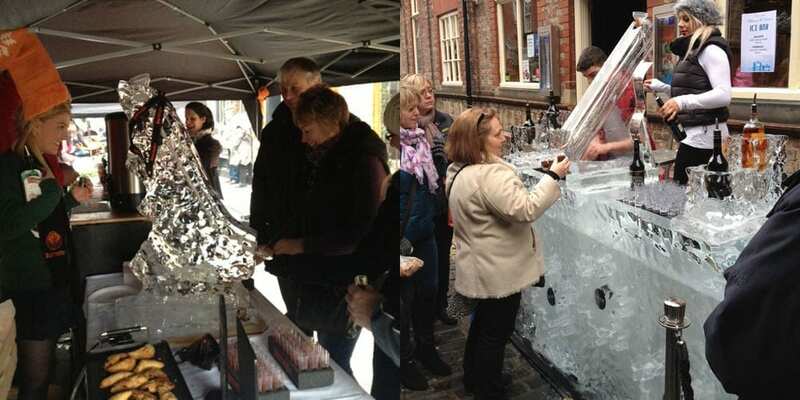 At last year’s Festival of Angels, we carved two separate sculptures with luge slopes incorporated so festive shoppers could stop off for an ice cold shot of Baileys – as you might imagine, it went down rather well! Logo luges are great for Christmas office parties, especially if the employees have no idea it’s coming. We are experts in carving luges after years of weekly practise, so we can advise you on all the tips and tricks to make it really stand out. Lighting is essential to the proper display of sculptures but we can highlight them with changing colours, or we can put physical objects to freeze inside the ice. 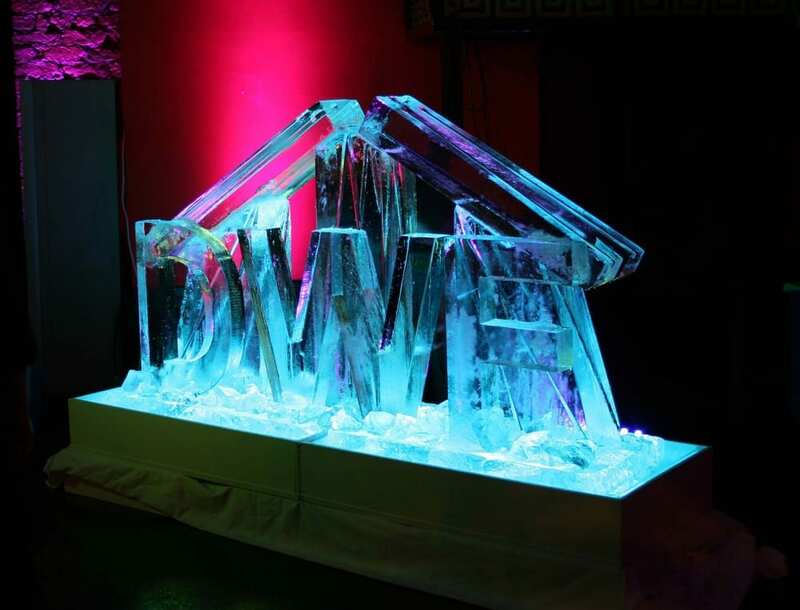 We love nothing more than a challenge, and can come up with a creative and impressive ice luge if you don’t have any ideas. This logo for DWF is one of the biggest we have ever made, over two metres in length! Usually our luges are smaller than this but we’re happy to make any adjustments possible to give you the ice luge you’re after, within reason of course! Our luges have gone the length and breadth of the UK, and even to an exclusive VIP event at the Cannes Film Festival in France, but in spirit they’ve gone even further afield. 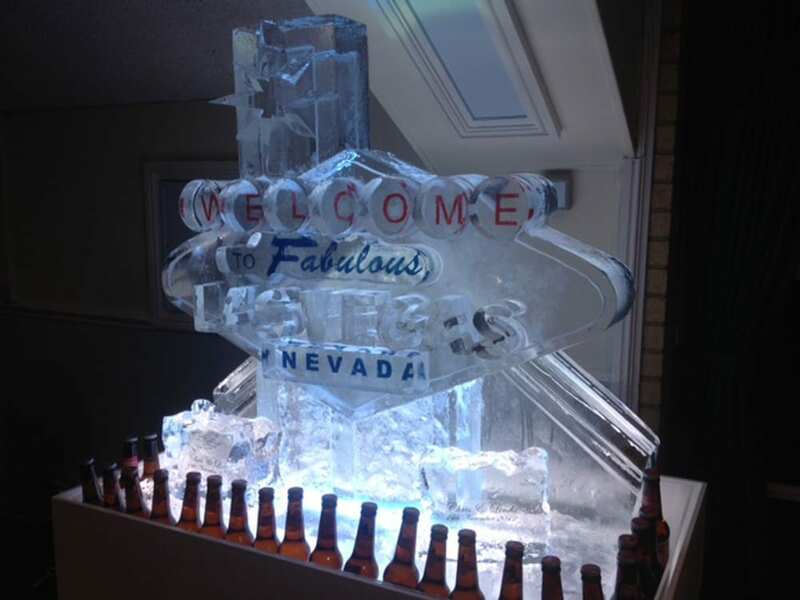 For a Las Vegas themed event we created a full-colour logo luge of the iconic “Welcome to Las Vegas” signpost – we can hardly imagine a better ice design for drinking! And even though you shouldn’t pour beer down the luge, you can use the sculpture display to keep the beer cool. Although we can rush orders for certain events, as much notice as possible makes things much easier for us. 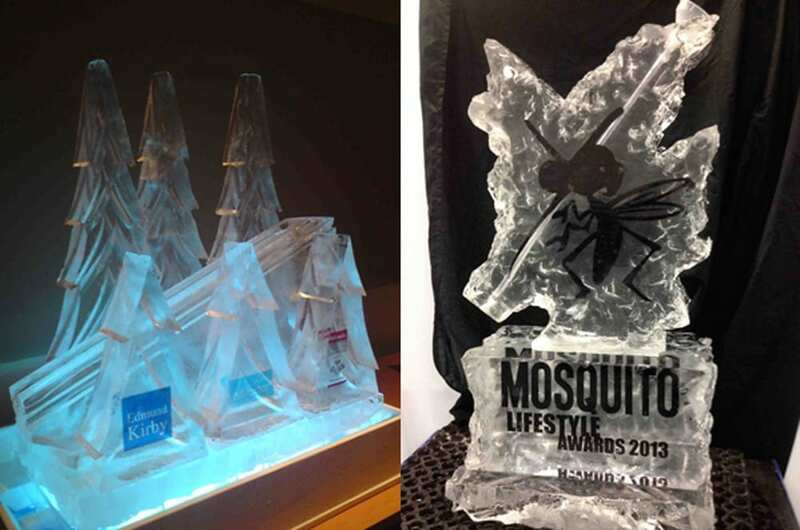 Our larger ice sculptures can take two or three days, maybe even more depending on the design, to sculpt. These are usually huge luges sitting on a base of 100 x 50cm, with the slope as tall as a metre and extending as long as the sculpture needs, they look at their best when illuminated from beneath. Our standard sized sculptures take around a day to hand carve and sit on a base around 60 x 40cm. The slopes are still around a metre tall and about 50cm in length. For custom sculptures we’ll discuss with you the best size, positioning and lighting. You may find some guides online to make ice luges, but in our professional opinion you will never get the same effect. Firstly, our ice is specially made to be crystal clear, something that can’t be achieved without specialist equipment and secondly, ice luges can be dangerous if not utilised properly! Setting up the draining, lifting the heavy – and slippery – material and ensuring it’s safely positioned so as not to fall on anyone are all skills we’ve learned through our years of experience. So, in summary – ice luges are fantastic for weddings, birthdays, public events, office parties, and virtually any other event where an ice cold drink sounds like a good idea! You can choose from our online or in-house portfolio or come to us with a new idea and let us run with it – creating unusual and individual sculptures and luges is what makes us tick!